Amanda R. Murphy | Attorney | Alvarez, Winthrop, Thompson & Storey, P.A. Amanda R. Murphy is an associate with Alvarez, Winthrop, Thompson & Storey, P.A. Her practice is focused on creditors’ rights, lender representation, residential and commercial real estate foreclosure litigation, title curative and contract review. Ms. Murphy earned her law degree at Stetson University College of Law in Gulfport, FL. 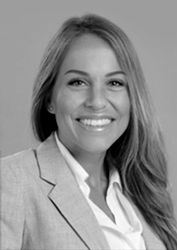 Prior to attending law school, Ms. Murphy received her Bachelor of Science in Legal Studies with a minor in Business Administration from the University of Central Florida in Orlando, FL. With over fifteen years of experience in the legal field, Ms. Murphy has been practicing civil litigation for over eight years. As an attorney, Ms. Murphy began her career representing lenders in residential foreclosures. After which, Ms. Murphy joined another multi-state law firm to assist lenders in exercising their rights in real estate evictions and commercial loan default matters, including federal civil litigation, bankruptcy, probate, and alternative dispute resolutions. Admitted to the United States Northern, Middle, and Southern District Courts, United States 11th Circuit Court of Appeals, Ms. Murphy has also received certification from the Florida Supreme Court as a county and circuit court mediator. Ms. Murphy is an active member of several voluntary bars and associations, currently serving as co-chair of the Alternative Dispute Resolution section of the Orange County Bar Association and on several charitable committees of the Central Florida Association for Women Lawyers. Ms. Murphy is a Floridian, having spent the last 31 years in Orlando. In her spare time, she enjoys the beach, playing soccer, and spending time with her two children.